Information from the online database of megachurches. This research is a joint effort of Scott Thumma of Hartford Institute and Warren Bird of Leadership Network of Dallas, Texas. This project is a joint effort of Scott Thumma of Hartford Institute and David Travis and Warren Bird of Leadership Network of Dallas, Texas. Listen online to the audio interview with the principal investigators of this research. This project is a joint effort of Scott Thumma of this Institute and David Travis and Warren Bird of Leadership Network of Dallas, Texas. A study of 153 megachurches from the Faith Communities Today project conducted between 1999-2000 at Hartford Institute for Religion Research with Scott Thumma as the Primary investigator. 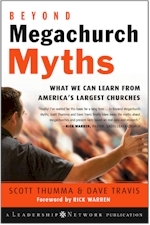 Summary report by Scott Thumma, Ph.D.
Dr. John Vaughan of the Megachurch Research Instituteassisted in the collection of the 2000 information about megachurches. Additionally, The Leadership Network and its representative Dave Travis sponsored and supported the research project. *Note: You must have the free Adobe reader installed on your computer to read pdf files. If you are interested in megachurches, you might find this 2007 book co-authored by Hartford Institute professor, Scott Thumma, interesting.